Last year on September 11th I composed a memorial post, and then went browsing among all the other bloggers who had posted their own memorials. There were some excellent posts and photo essays, notably at Michelle Malkin, Dr. Sanity, and CUANAS, and all so much better than my own. So this year I will do something different: I will commemorate the events of five years ago by revisiting events of 323 years ago. I refer, of course, to the other 9-11: September 11th, 1683, the day when an alliance of Christian armies led by Jan III Sobieski, the King of Poland, arrived at the Gates of Vienna. The Ottoman Empire had been expanding into Europe ever since Constantinople fell to the Turks, and even before that. Wherever the Muslim armies went, they plundered cities, took slaves, turned churches into mosques, and converted many thousands of Christian captives to Islam at the point of a sword. The Sultan’s armies overran Greece, Bulgaria, Romania, and Serbia. They turned Protestant Hungary into a compliant vassal and made war repeatedly on Austria and the Polish-Lithuanian Commonwealth. The Ottomans had designs on Vienna, since the fall of the city would open the way into the heart of Austria and the rich principalities of southern Germany. Having failed to take Vienna in the siege of 1529, the Turks prepared a second attempt in 1683. Under the leadership of the Grand Vizier, Pasha Kara Mustafa, and with their Tatar and Malaysian allies, they made their preparations and fought their way towards the capital, overrunning Austrian villages and smaller cities in their path and taking many captives. As the Muslim hordes approached Vienna, King Leopold fled west with most of the citizens, leaving a garrison of about 11,000 soldiers and 5,000 citizen volunteers to hold the city against the Turks. 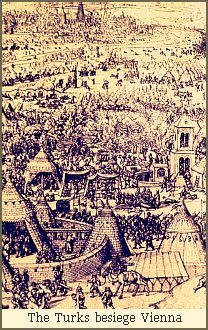 The Viennese razed buildings in the area around the city walls in order to deny the enemy cover, and brought livestock and provender into the city to prepare for a siege. On July 16th, 1683, the second siege of Vienna began. The tiny garrison in the city was no match for Kara Mustafa’s army of 140,000, but the Grand Vizier decided to starve the city into submission rather than attempt a frontal assault on its defenses. One of the main reasons the Turks had had such success in the Balkans and Eastern Europe was that their Christian enemies were unable to unite against them. Since the Caliphate and the Ottoman Empire were one and the same thing, Islam experienced no such fractiousness, and it was a united horde that advanced inexorably through the mountain passes and across the plains towards Vienna. Austria and Poland had long been traditional enemies, only lately coming to an alliance in the face of the common threat. 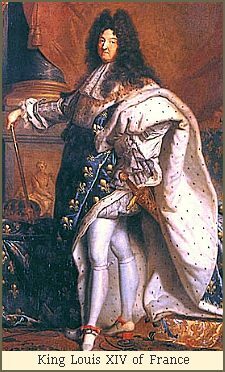 Poland had traditionally been allied with France, but the French were devious even in alliance, especially under Louis XIV, the Sun King. Louis had designs on the German states along the Rhine, and conducted his diplomacy with an eye towards the main chance in Luxembourg or the Rhenish Palatinates. All of these squabbling political entities were Catholic, and theoretically united under the leadership of Rome. Pope Innocent XI recognized the danger posed by the Ottomans, and, in the name of God and the Church, called on all the rulers of Central Europe to unite against the common foe and save Vienna. Louis XIV declined to obey his pontiff, and continued his scheming. Jan Sobieski, on the other hand, was ready to answer the Pope’s call. However, in order to go to war, Polish law required him to get the unanimous approval of the Polish Diet. The French king’s ambassador plied members of the Diet with massive bribes to induce them to vote against Sobieski’s venture. Through most of the summer it seemed that Sobieski would be unable to ride to Vienna. Fortunately for the Austrians, and for Christendom, Pope Innocent authorized the papal nuncio in Kraków to use the full resources of the Vatican. The nuncio was able to outbid Louis in bribery, but only barely. In the end the Diet reached unanimity and authorized their King to ride to the relief of Vienna. When the King of Poland set off for Vienna in early September, the Viennese garrison was in desperate straits. The people of the city were starving, and the city had suffered serious damage from the Turkish bombardment. The Ottoman armies’ artillery pieces were of inferior design, and were unable to reduce the city walls, so the Turks had taken to tunneling. They had ample gunpowder, and their engineers dug mines under the walls and set off a number of charges that did serious damage and opened gaps in the walls. The Viennese rallied to build barriers in the gaps, and managed to keep the Turks out, but it was only a matter of time until Kara Mustafa succeeded. The Viennese garrison prepared for a last-ditch defense within the city walls. It was then, at the last possible moment on the evening of September 11th, that Jan Sobieski arrived at a hill north of the city, leading a force of 40,000 Poles and their German and Austrian allies. The battle began soon afterwards, in the early morning hours of September 12th. The Austrians and Germans attacked the Turks first at the center and on the left flank. The Turks counterattacked, but held back a significant portion of their forces in anticipation of entering the city through a breach in the wall. 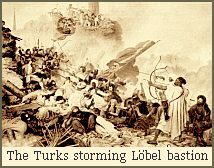 That very morning the Grand Vizier had prepared a second and more powerful charge to be set off under the Löbel bastion, one that would throw the city open to the Turkish forces once and for all. Unfortunately for Kara Mustafa, the Austrians within the city had mounted a counter-tunneling operation. The Austrian “moles” detected the Turkish mine, found the charge, and defused it. 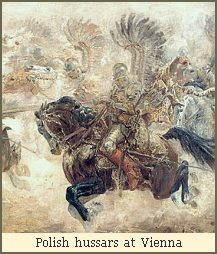 At about the same time the King of Poland, in the van with the fearsome Winged Hussars and with 20,000 men behind him, led a cavalry charge down the hill into the right flank of the Ottoman army. The Hussars were one of the most formidable fighting forces of the time, and the sound of the wind through the feathers of their artificial wings was said to unnerve the enemies’ horses and drive superstitious soldiers into a panic. The battle was over in three hours. The King drove through the Turkish lines, and, seeing his success, the Vienna garrison sallied forth from the city and hit the Turks from the rear. Demoralized by these attacks and their failure to breach the wall, the Turks fled eastwards in haste, abandoning their tents, weapons, battle standards, provisions, and slaves. The siege was broken and city was saved. 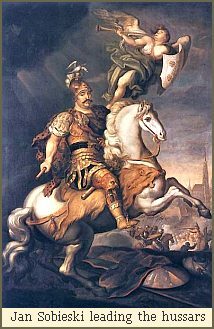 Jan III Sobieski was received as the hero of Vienna. Though it was not evident at the time, the Ottoman tide had turned at the Gates of Vienna and was about to recede, beginning its long withdrawal through the Balkans and Greece into Asia Minor over the next two centuries. And what became of the principals? 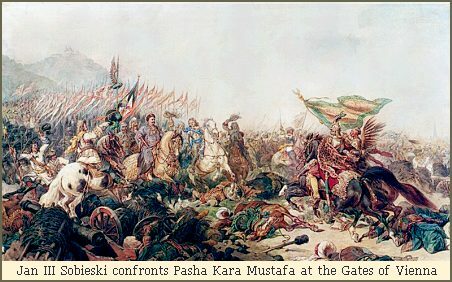 Pasha Kara Mustafa was executed in Belgrade later that year, paying the ultimate price for his monumental failure. Jan Sobieski returned to Poland a hero. Austria gradually regained its lost territories, and then some. And King Louis continued his campaign against the German states: in the absence of their defenders, Luxembourg and other small German states were unable to resist, and were annexed by the French. Over the long term, good relations between Poland and its neighbors to the west did not last; with the ebbing of the Turkish threat the old enmities returned. Barely a century later Austria, Prussia, and Russia presided over the final partition of Poland, and the Polish state ceased to exist until it was reborn at the end of the Great War in 1918. 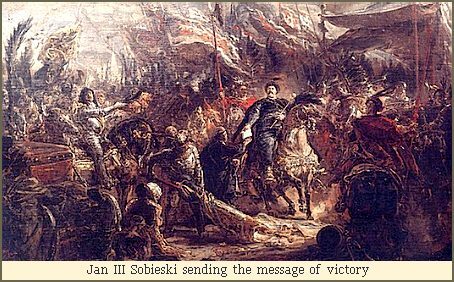 What is striking about Jan III Sobieski is the quality of his leadership. More important than arms, manpower, tactics, supplies, and even courage, leadership is what makes the difference in any war. When Jan Sobieski led his men down that hill into the Ottoman flank, it was his presence at the front of the charge that demonstrated his dauntless nature and absolute determination. Character cannot be faked, and men who recognize this kind of character in their leader will follow him into the gates of Hell. The raising of the siege of Vienna puts me in mind of another conflict, a hemisphere and almost two centuries away from Vienna in 1683. As the Russian and Austrian empires were pushing the Ottomans ever further back in the mid-19th century, the young American republic was in the throes of its major existential crisis, the War Between the States, a.k.a. the American Civil War. The character of leadership in the Civil War was much in evidence. The armies of the North greatly outnumbered the those of the South, and the North was better supplied, technically more advanced, and better armed. Yet in the early part of the war the vast Union army commanded by General George McClellan was unable to make significant advances against a much smaller and poorly-supplied Confederate army. This stalemate reflected the character of McClellan, who was a weak, vacillating, and vain commander. The successes of the Confederacy during the same period were also owed to the character of a single man: General Thomas Jonathan “Stonewall” Jackson. The character of his leadership was such that on numerous occasions he could rouse the men under his command from exhausted despair to unparalleled feats on the battlefield. It was not his exhortations, nor his pep talks, nor his provisioning of the commissary; it was his example as a leader that inspired his men to unswerving loyalty and dedication. 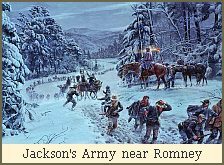 In the Romney campaign, just after New Year’s in 1862, Jackson had been given an objective which required his men to make long marches in abominable weather to the upper reaches of the Potomac, in what is now West Virginia. In that terrible winter’s march and exposure, Jackson endured all that any private was exposed to. One morning, near Bath, some of his men, having crawled out from under their snow-laden blankets, half-frozen, were cursing him as the cause of their sufferings. He lay close by under a tree, also snowed under, and heard all this; and, without noticing it, presently crawled out, too, and, shaking the snow off, made some jocular remark to the nearest men, who had no idea he had ridden up in the night and lain down amongst them. The incident ran through the little army in a few hours, and reconciled his followers to all the hardships of the expedition, and fully reestablished his popularity. Other parts of Stonewall Jackson’s career are reminiscent of Sobieski. Like the Polish King, the Confederate General routed a numerically superior force in the battles of Front Royal and Strasburg, and sent the Federals fleeing northwards in haste, leaving their baggage, artillery, and wagon train behind. Jackson, seeing the chance of a breakthrough to the Potomac, followed the Union troops down the Shenandoah Valley towards Winchester. When he realized that by tactical audacity he could spare his soldiers a real fight and gain his objective, he pushed them to the limits of their endurance in order to reach Winchester before the Union troops could get there. Most of all Jackson wanted to seize a commanding hill southwest of Winchester to prevent the Federals from occupying it in force and with artillery. He drove his soldiers onward deep into the night. At about 1 A.M. on May 25, the chief of the Third Brigade of Jackson’s division, Col. Samuel V. Fulkerson, suggested that the men be allowed to rest for an hour or two. The column halted. Thousands of Rebel soldiers slumped in their tracks and fell asleep in the road. At 4 A.M. on Sunday, May 25, Jackson, who’d kept watch as his men slept, passed the word down the column for the men to arise. They quickly got under arms and were on their way. He kept watch as his men slept. It’s no wonder that his men were willing to follow him into the gates of Hell: he endured anything that they endured, and more. Like Sobieski, Jackson was always in the van. He was returning from the battle near Chancellorsville in 1863 when a Rebel bullet fired in error caught his arm. He lost his arm, and then his life, and the South lost the war. Stonewall Jackson was a tactical and strategic genius, as proved by his repeated successes against a numerically superior foe. His moves, like Hannibal’s, will be studied by tacticians for as long as men make war against one another. But it was his character, the quality of his leadership, that defined who he was. It’s possible for such a leader to lose a war, but an army that lacks that kind of leadership will find it almost impossible to win. The nature of war has changed so much in the last century and a half that it is no longer possible for commanding generals to lead their men in the field. Even if they wished to do so, it would not have the tactical significance that it did when Jan Sobieski could lead a cavalry charge down a hillside against an enemy force more than four times as large as his own. But still… One longs to see that kind of character in our leaders. We got a glimpse of it from Rudy Giuliani in the days after 9-11, and when the President grabbed a bullhorn and climbed the pile of rubble at Ground Zero. But these days it’s mostly soundbites and press conferences and position papers and policy meetings — the very nature of leadership has changed. To be sure, down at the platoon and company level in Iraq and Afghanistan the same kind of inspirational leadership is exhibited every day, with the lieutenants taking a higher rate of casualties than any other rank. The milbloggers see to it that we’re all aware of it. But at the brigade level such actions are no longer possible. He learned, too, to put himself into his adversary’s place and to realise his weakness. He learned, in a word, that war is a struggle between two intellects rather than the conflict of masses; and it was by reason of this knowledge that he played on the hearts of his enemies with such extraordinary skill. If war is a struggle between two intellects, and if this is an information war, then the intellectual battle isn’t between General Franks and Saddam Hussein. It isn’t even between George W. Bush and Mahmoud Ahmadinejad. It’s between Katie Couric and Osama bin Laden. It’s between Pinch Sulzberger and Ayman al-Zawahiri. Anyone want to place bets on these contests? But there’s a lot of informational cannon fodder out there in this war, and a lot of potential character ripe for leadership. People like Wretchard and James Lileks and Mark Steyn are out there, providing clarity of thought and insight that is sorely lacking among our leaders and in our media. When things get bad enough, people like them will arise naturally as leaders, because that is when we will need them. When the time of trouble gets here, a virtual Holger Danske will emerge from the cellars of Kronborg, shake the cobwebs out of his beard, put on his helmet, pick up his sword, and take up once again the defense of the Realm. Charles Martel will pick up his hammer and enter the fray. Jan III Sobieski will rise up from his bed of rest, rouse the Winged Hussars, and lead a cavalry charge down the information highway. A Stonewall Jackson of the blogosphere will emerge, scratch his red beard, look deeply into the mind of the enemy, and discover how to use his weaknesses to overcome him. On a bright September morning in 1683 the tide of the second wave of the Great Islamic Jihad turned and began to ebb. On a bright September morning in 2001, the tide of the third wave of the Great Islamic Jihad was at its flood. But this tide will turn, too. Sobieski is out there, waiting to be awakened and ready for the call to raise the siege at the Gates of Vienna. Update: I corrected an error about the wounding of Stonewall Jackson at Chancellorsville. Thanks to alert commenters Yorkshireminer and Robert D Halpert MD for the correction. Wow..riviting, powerful, well researched, insightful, and engaging. The intersections of destiny, fate, desire and passion create a great leader. Let us hope and pray for such a man, in this, our accelerated time of peril. On this 5th anniversary......God bless this great and good countrty, its soldiers and sailors, its farmers and businessmen, its Constitution, and all who understand that real peace comes from within: integrity, morality and self respect. And the other peace only come from great sacrifice, great effort, and national uniity. "Do not mourn that such men died, but thank God that they lived." "And that’s why I’m here, writing this. Any effect I can have on the events of our time will be miniscule at best. But when there are many thousands of us doing the same thing…"
Stay in the fight, and thanks for being a leader of it. This post belongs on The Required Reading List. While Stonewall Jackson was militarily a great general, let us not forget that he fought for a nation (the Confederacy) which came into being to defend slavery. The use of Jackson for 9/11, when we are fighting for freedom against Islamofascists who would enslave us (and already enslave millions in Africa) seems highly inappropriate to me. I'm no military historian, but surely you could have found a brilliant American General who actually fought FOR us? The Confederacy did not arise for the prime purpose of defending slavery, but rather to preserve self-determination. Would men die by the millions for the right to treat blacks as chattel? I sincerely doubt it. Would men die in those numbers to fight to preserve their homeland and independence? Yes. Remember that 1/10th of the male population that could own slaves, did. Remember also that the vast number of plantation owners were Whigs, who opposed the war on the grounds it would disrupt trade (and hence their profit). Remember that Abraham Lincoln suspended the Constitution and forcibly closed presses. Remember that the Emancipation Proclamation applied only to the areas directly under the Union army's control, and that Lincoln was all in favor of shipping blacks back to Africa. What I find highly inappropriate is the amount of historical ignorance floating around the Net these days. Regardless of all that, a great post Baron. It is one for the ages. Thank you, Baron. Tears have rolled down my face twice now during this 9/11 weekend. Once at a tribute paid by a blogger in Italy. And now, this. This must be the best post at the Gates of Vienna. 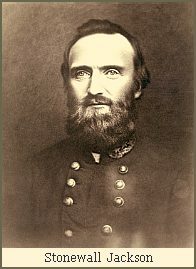 The Left in America or the EU (a do-it-to-yourself project if ever there was one) will never understand the courage and the moral character of men like Stonewall Jackson. They will snipe and complain, and they will live under the blood of his sacrifice and the sacrifice of men like him and those who fought for him, but they are like snarling dogs, mistaking patience for weakness. But like snarling dogs, they will turn upon themselves. I get much more angry at 9/11 and what I see as our continuing denial than I get sad; so briefly, thank you. Kudos to Russet Shadows too and Profitsbeard. I did write about somebody who fought for us. I'm a Virginian, and he fought on behalf of the Sovereign Commonwealth of Virginia, for my ancestors, and not for slavery. He owned no slaves, but he was loyal to his homeland. Ironically, his birthplace became part of West Virginia and was thus in the Union. My great-great grandfather fought for the Confederacy, and his home was burned to the ground by the Yankees. I will not repudiate him, even though the cause he fought for was unjust. Stonewall Jackson is inspiring because of the quality of his character, not because of the cause of the Confederacy. It is fortunate for all of us that God took him when He did, because otherwise the South might have won. I'm proud to be a Virginian, without being a supporter of the cause of slavery. There were many Virginians in 1862 who felt the same way. Anyone who has deep family history here can probably tell you similar stories. To reiterate: I do not support the Confederate cause. I never fly the Confederate battle flag, as do some in my neighborhood. Our cause was not righteous, but some of the men who fought for the South were among the best soldiers ever to take the field. Stonewall Jackson will be an inspiration to soldiers for his genius and his character long after the cause he fought on behalf of is lost in the mists of time and forgotten. As I was reading your account of the Battle of Vienna, I was wondering of Tolken used it as a model in the "Lord of the Rings". How very similar Jackson and Sobieski were, both staunch in there religious beliefs, Sobieski a Catholic, Jackson one of those pesky Methodists types that have been causing all the trouble lately Both great cavalry leaders. Jackson with his foot cavalry, for that is what they were called. 35 miles a day and many of the men without boots, it takes a special person to get his troops to do that, There tactics were the same, always the left hook, Jackson always appeared out of the fog of war to smash into the right flank of his enemy. History might not repeat itself but it certainly does rhyme. Only one quibble Baron. I always thought that Jackson was shot by one of his own sentries coming back from a reconnaissance and not leading a skirmish, I may be wrong. I have also been thinking about what happened five years ago. It is easy to remember, it is one of those dates that everybody remembers what they were doing when it happened as you rember where you were when President Kennedy was killed or when the first men landed on the moon. I can rember with a cold clarity talking to a friend in Yorkshire when she suddenly screamed down the telephone a plane had crashed into a skyscraper in New York. I put the phone down and switched on the television. I was thinking what a terrible tragedy when the second plane crashed into the next tower then I knew instantly that it was not an accident. Then with tears running down my face I heard myself repeating the phrase You B##tard you Ffing B##tards to no one in particular. I felt so impotent, like most Englishmen in times of trouble, I went and made myself a mug of tea, fortified with a good measure of Scotch whiskey. I was so angry. I slowly quieten down, but it took nearly all day. I have often pondered over what would have been Americas reaction, if these undead morons, there is something obscene about a religion that can persuade its followers that death is preferable to life, had been even more successful and destroyed The White House or Congress. The smouldering ruins of The White House, would certainly have concentrated the minds of the politicians wondrously, and they wouldn't have slipped so easily back into the business as usual mood. i.e. Snout in the trough. Sorry my cynicism is showing through, it seems as if I am belittling America I am not, I am thinking of you today. I am writing this from my heart, it is difficult to express my feeling, words seem so inadequate, they seem to resonate like platitudes. I would like to pray for you but it is not my style, so I have gone and poured myself a good stiff single malt scotch whiskey it is waiting now by the side of my Monitor and when I have finished this posting I am going to raise my glass and propose a simple toast, I hope all of us, the Americans and we over in Europe and the rest of the world who post here will do something similar today. TO AMERICA. "One of the main reasons the Turks had had such success in the Balkans and Eastern Europe was that their Christian enemies were unable to unite against them. Since the Caliphate and the Ottoman Empire were one and the same thing, Islam experienced no such fractiousness, and it was a united horde that advanced inexorably through the mountain passes and across the plains towards Vienna." "Louis had designs on the German states along the Rhine, and conducted his diplomacy with an eye towards the main chance in Luxembourg or the Rhenish Palatinates." "Louis XIV declined to obey his pontiff, and continued his scheming." You did say "323 years ago", Baron...? Rousing piece. One comment: don't give up on all our middle level leadership (0-6 to 0-8, Brigade to Division). While at the Brigade level, it is getting more difficult to engage at the tactical fight as a commander, it still happens with good effect (ThunderRun into Baghdad..). We have leaders that know how to fight this war, unfortunately the politicians are always looking for the easy way out when sometimes they need to let the troops slog it out. Stonewall Jackson will be an inspiration to soldiers for his genius and his character long after the cause he fought on behalf of is lost in the mists of time and forgotten. Seconded. I'm no military historian, but surely you could have found a brilliant American General who actually fought FOR us? Coming from zero, that'd mean a brilliant American general who fought for the Jews? Excellent piece that went the necessary step forward to discuss the leadership necessary to accomplish what sometimes seems impossible. General Jackson did not live by polls or public persuasion, but by personal habits born of his beliefs. As a professor, he was thought quite odd because of the depths of beliefs and his dedication to detail. It is said that the people in town set their watches by his morning walk to the school. Jackson was that dedicated. As many Americans, my family fought on both sides in "The War of Northern Aggression". My Virginia relatives still refer to this because of the events as they occurred prior 1860. Some will recoil at the idea, but there were larger issues afoot than slavery much as there were larger issues afoot than freeing the Jews of 1940. Thank you Gates of Vienna! The quality of men is ageless and each age brings us men of quality. So bearing in mind what we know about Jan Sobieski and about 2001, would you think today (or any day) to be an ideal occasion for the "leader" of Britain's "Conservative" Party to make the following inane observation ? Does he have perhaps a profound knowledge of any faith ? I somehow suspect bin Laden has a more profound comprehension of Islam than does David Cameron or Tony Blair or George Bush..............there is something absurd about the terms "wholly incorrect"
While praising, and deservedly so, do not forget the valor of the Knights of Malta and their Grand Master, Jean Parisol de La Valette some 120 years earlier. "a formidable army composed of audacious barbarians is descending on this island. These persons, my brothers, are the enemies of Jesus Christ. Today it is a question of the defense of our faith -- as to whether the Gospels are to be superseded by the Koran. God on this occasion demands of us our lives, already vowed to his service. Happy will be those who first consummate this sacrifice." The threat remains the same. Ah, somewhat like "Rev" Fred Phelps? Here is something to laugh about. The planes where made from verses from the koran that all Muslims follow. The Muslim Brotherhood are mad, that they where not made from verses, only the Sunni follow. Bin Laden being Sunni and all that. A interesting book concerning leadership and battle is "The Mask of Command" by John Keegan from the late 1990's. keegan spaeaks to battle commanders from Alexander to WWII. Let us not forget September 11th, 2001 and those who have died on this day. Never forget. "the very nature of leadership has changed"
Instead, I believe we have seen a clear delineation between politician and leader. Wonderful piece - the line with Holger Danske really touched me. Thanks for the additional correction on Chancellorsville. I knew Jackson was a Presbyterian; it was one of the commenters, and not I, who dubbed him a Methodist. I had you in mind when I included Holger Danske; I borrowed him from your comment the other day. I, for one, will be happy when the Vikings awaken. Excellent post sir. There is reason and civility in this country and you are an example. Continue with the good work. Thank you for that long and thoughtful post. In 1683, not for the only time, Poles made great sacrifices for others. They were not themselves in imminent danger from the Turks. By removing the Turkish threat to Austria and Russia, they made it easier for those two nations to swallow up Poland later on. After one of the failed Polish uprisings (can't remember which one) a group of Polish exiles settled in Turkey, in Istanbul, creating the community of "Polonezkoy". Such are the ironies of history. is reassuring. A man on his horse. I will just quote here from Laurence Auster. After September 11 comes September 12—September 12, 1683, that is, the day on which the European powers under the leadership of the Polish king Jan Sobieski defeated the Turks at the battle of Vienna and ended the Moslems’ attempt to capture the city. The great Ottoman power then proceeded to ebb, bringing to a close a thousand years of ceaseless Moslem attacks on Europe and making the modern world possible. … until, of course, in the late 20th century, a Europe that no longer remembered or cared what Moslems were, or what Europe itself was, welcomed back its old enemy in the form of millions of Moslem immigrants, as though that millennium of fear and struggle and loss had never been. Thanks to Laurence Auster of VFR for reminding us. yorkshireminer (tink) To England, my second love, especially the yorkshire countryside. It pains me to see the progress into dhimmitude your country now suffers, and I mourn your, and everyones, loss of freedom as it ebbs. Thanks for your support, and never forget that there are those over here that know we are sister countries, and that those things can survive leftist idiots on both coasts. The War of Northern Agression was started way before 1787, but came to a head at that time. The discussion was whether to allow representation in Congress of a state on an equal number per state basis or based on population. Some felt that more people in a state should give it more power, but those in the Northern states refused this idea, afraid that the larger Southern states would therefore have larger populations, something that hasn't borne true even two hundred fifty years later. However, this led to a bicameral legislature as a compromise. Unfortunately, the compromise over representation was simply a symptom covered up, and the larger problem was between the industrial North and the agricultural South. The famous "3/5ths" rule came because of this, and it wasn't just slaves. Representation based on population became representation based upon VOTING populations, and only white male citizens could vote. Therefore, to decide how many representatives a state had, the rest of the population (slaves, women, foreigners, etc.) were taken as 3/5ths, or counted as sixty percent of their actual number. This rule actually had nothing to do with slavery, no matter how it might have been abused later. The first instance I could find, or "shot", if you will, in the WNA, was actually between New York and New Jersey, in the late 1790's, where a tugboat was forced to license itself in both New York and New Jersey. The decision was that a Federal License was needed, and this started the whole Federal vs. State's rights, and which superceded which. For the next sixty years, the Northern Senators/Congressmen waged an economic war against the South, and slavery didn't come into until they argued over cargo laws, which included slaves, and they then whipped up support for their side claiming the South were heathens for treating "men" like cargo, even though Northerners had slaves, too. It is interesting to note that there were 4000 BLACK slaveowners in the south, that Southerners, not really as a rule, but certainly more than spottily, released their slaves, especially when the entire family went off to war, rather than leave them on the plantation without leadership. Quite often these slaves volunteered to fight for the South, usually at the side of their former Masters, as free men. They considered the Federal Government worse than the State Government, and that they were fighting for their freedom just as well on the side of the South as well as the North. It is also interesting to note that Lincoln's attempt to free the slaves, the Emancipation Proclamation, was intended only to free slaves in the South, while they were actually a different country, which means he was trying to legislate something for them that he didn't have in his own country. And, also to note, it didn't happen for two years, and didn't happen until he thought he was being beaten, and he finally did so, by some accounts, only to encourage blacks to come fight for the North, telling them it was for their freedom. Hard to convince someone who's been free for two years that he's fighting for his freedom, when if the North had won in those early days, he'd have still be a slave. Sorry for eating up your bandwidth for this probably-useless tirade Baron. And great article, thanks for writing it. Could you email a permanent link to it so I can constantly give it as a reference? On other blogs, I drop your link quite often because of the well researched content, and this one is no exception. Thanks again. I first earned an appreciation for the 'Gates of Vienna' when I visited the Heerengeschichtliches Museum (Military Hero's Museum) in Vienna two years ago. Though thoroughly sacked by the Russians after WWII, it has fantastic displays and some artifacts from the MULTIPLE sieges of Vienna by the Ottomans. Also, the Stadts Museum (City Museum) of Vienna and the Riesenrad (Ferris Wheel) have diaramas showing the siege and its progress. After visiting Europe, I find it ironic that this continent drenched in dynastic slaughter for two millenia possesses a native populace believing they invented peace. Believing so, they are under the illusion that America has arrogantly undertaken to destroy this peace and that we are therefore to be condemned. They probably still beleive that "Islam means peace". I don't know which is more incredible, archonix, the war, the multitude of reasons it was fought, the distortions of it for their own benefit people make, or the total ignoring of the lessons learned from it now. One think I didn't mention is that slavery was already on it's way out, and with the invention of the cotton gin, that would have accelerated the process greatly. But the North would still have had even more reason then to attack the South, because it would have gotten stronger. Today, we try to put the Iraq war down to this or that reason, but just like the NWA, the Iraq war, and both WW's, the reasons for war are always local, regional, and international in basis; religious, political, and secular all at the same time; comprised of the same faces on both sides, it's only when you see things from certain distances that it takes on another face. Such is war, and the affairs of men. Great post, Baron. It really got my blood pumping; I felt the call to battle, as it were, and am ready to charge forth behind the great leader who will save us from this mess. In "Thoughts after Lambeth" TS Eliot wrote, "The World is trying the experiment of attempting to form a civilized but non-Christian mentality. The experiment will fail; but we must be very patient in awaiting its collapse; meanwhile redeeming the time: so that the Faith may be preserved alive through the dark ages before us; to renew and rebuild civilization, and save the World from suicide." What he wrote decades ago opposing secularism, communism, and fascism rings truer today than in his time. Leftist decay and Islam are the very barbarism he warned about overtaking the Christian and Western world. Sorry to inform you, but your comments about Lincoln are largely wrong- one might even say ignorant. Lincoln issued the Proclamation only in the South, yes. However, to say that "they were actually a different country" goes to the heart of the matter: Lincoln argued all along that the South was NOT another country, but a rebellious province. So you are accusing him of something based upon a premise that is wrong. In fact, he stated once that if he could win the War by releasing some slaves and not others he would do it, and if he could win by releasing all the slaves he would do that. In his mind, the War was about the Union, and not slavery. Further, he recognized that once the War was over, slavery in the Northern States (i.e Maryland, Kentucky and Missouri) would die a quick death. Also, you claim that "it didn't happen for two years, and didn't happen until he thought he was being beaten, and he finally did so, by some accounts, only to encourage blacks to come fight for the North, telling them it was for their freedom". This is ridiculous, as any student of the War knows. It didn't happen for 2 years (Actually 1, but who's counting) because it was politically impossible. Further, he waited, as EVERY historian I have ever read agrees, until he had won a victory (i.e. Antietam), lest people think he was appealing to the slaves. This is why Antietam is correctly regarded as the Turning Point of the War. Where you get our information is frankly a puzzle to me, as I have a History Degree, and have read about the Civil War for almost 40 years. Further, you state that slaves felt the Federal Government was a bigger threat than the individual states. What is this based on? Again, I have never come across this, and find it absurd. Slaves did not "enlist" in the Confederate army, for the simple reason that they were not allowed to do so. Yes, some black servants did fight, and many went with their Master voluntarily. But in 1864 General Pat Cleburne (a native of Ireland) suggested Black emancipation and enlistment, and was quietly shut down by higher ups. It wasn't until a very short time before Appomattox that the South reconsidered, and by then it was far too late. Oh, to clarify, Cleburne was a Confederate General, and a very good one. The wings of the Hussars had a practical purpose. There was a connection between the tops of the two wings, so that they formed a wide triangle. One of the tactics for fighting heavy calvary was to lasso the Hussar and pull him from his horse. The triangle formed by the wings defeated the lasso because it made the top of the Hussar wider than the loop of the lasso. If a hussar was dismounted, the armor was so heavy that he could not fight effectively, and he would be quickly killed. "I, for one, will be happy when the Vikings awaken." The Vikings have awoken and you my dear Baron are one of us. The Warrior is honered. Even more so is the Skjald. He is the one who can use words to make others see worlds with their inner eyes. He can pull down a king with a verse or rise an army with a song. Rich, thanks for the information on the hussars' wings. I didn't know that. You wrote: Under the leadership of the Grand Vizier, Pasha Kara Mustafa, and with their Tatar and Malaysian allies, they made their preparations and fought their way towards the capital, overrunning Austrian villages and smaller cities in their path and taking many captives. Malaysian?? A type, perhaps, since the country did not exist then? They were listed as "Malaysian" in two sources I read. Presumably they were from the Malay peninsula, and "Malaysian" is a non-cumbersome way of referring to them. Whatever political entity was extant in the area at the time (maybe Pattani, but I really have no idea) would not have been recognizable to most readers. I think Malaysian is fine for the purpose. "Sorry to inform you, but your comments about Lincoln are largely wrong- one might even say ignorant. Lincoln issued the Proclamation only in the South, yes." "However, to say that "they were actually a different country" goes to the heart of the matter: Lincoln argued all along that the South was NOT another country, but a rebellious province." And his argument has been proven wrong every time it was looked at. In fact, the ability to cecede from the Union was agreed to before the South would sign on to being part of the United States. "So you are accusing him of something based upon a premise that is wrong." Sorry, but for a forty year scholar of history, it is YOU who are wrong here, at least on this one instance. Which is usually listed as evidence that the war was not about slavery at all. "Further, he recognized that once the War was over, slavery in the Northern States (i.e Maryland, Kentucky and Missouri) would die a quick death." Right. Outlawed it in the South, but allowed it in the North. Which part of my statement was wrong or ignorant again? "Also, you claim that "it didn't happen for two years, and didn't happen until he thought he was being beaten, and he finally did so, by some accounts, only to encourage blacks to come fight for the North, telling them it was for their freedom". This is ridiculous, as any student of the War knows." Any student of the war will find many historical accounts, all giving different versions of Lincoln's reasons for the EP and it's timing. To say that any one is any more wrong than any other is ludicrous, and frankly, your ridicule of me for being ignorant because you choose to ignore those texts that have clearly laid out these arguments shows me how biased you are in your research. Perhaps this is why you choose to ignore "history", or at least, those parts that don't agree with your worldview. "It didn't happen for 2 years (Actually 1, but who's counting) because it was politically impossible." No, politically impossible was his excuse, because he was a weak leader. It was a document he signed. Tell me how that is politically impossible, please? It didn't require votes through congress, did it? It didn't require voting on by the general public did it? And let's just look at the dates. EP signed on 1Jan63, Civil War, first shot fired, 12Apr61...hmmm, let's see, one year and nine months is closer to two years, so I'll take that as being nothing more than pettifoggery. "Further, he waited, as EVERY historian I have ever read agrees, until he had won a victory (i.e. Antietam), lest people think he was appealing to the slaves." But, have you read every historian, or are you reading only those historians that agree with your viewpoint? Lincoln's motivations for signing, or not signing, can be attributed to many things, but what anyone says about motivations is underscored by the fact that HE DIDN'T SIGN it until long after he should have, if the NWA WAS really about slavery. If it wasn't, then you've conceded the point that it was about whether or not States had the right to cecede. "This is why Antietam is correctly regarded as the Turning Point of the War." In your opinion, and yes, I've seen others that say different, but then again, no one's OPINION is any better than anyone elses, is it? And there can be many turning points, and something can be considered a turning point in the war for many reasons at once. That doesn't make it THE turning point, or that it was only because he was waiting for a single victory (they had them before antietam, I believe, seems like it was called, uh, Fort Sumpter. Remember that one?). That concept is ludicrous, and a politician's wiggle if ever there was one. "Where you get our information is frankly a puzzle to me, as I have a History Degree, and have read about the Civil War for almost 40 years." Not sure, I read it all out of books from the Public Library. Maybe you should expand your reading list to NON-politically correct authors. "Further, you state that slaves felt the Federal Government was a bigger threat than the individual states." Not sure where you get this, but again, it's an opinion being placed to people, and I only stated SOME of the feelings and motivations of SOME of the slaves, those who's accounts I read in their own words. You are trying to make it apply to ALL, something you can't do to any thing. Things are always more complex than that. "What is this based on? Again, I have never come across this, and find it absurd." Accounts of slaves fighting for the South in various books. I only wish I could give you all the references, but again, it's read over the last twenty years, and unlike some people, I don't remember every book/author I've ever read. Suffice it to say, if I could find it, you should be able to find it as well, if you're truly looking for it. "Slaves did not "enlist" in the Confederate army, for the simple reason that they were not allowed to do so. Yes, some black servants did fight, and many went with their Master voluntarily." I believe I said "fought for", I didn't make the claim of enlistment, but again, this is pettifoggery. What is the difference between dying for the CSA as an enlisted man and as a freed slave? They fought for the South, out of choice. 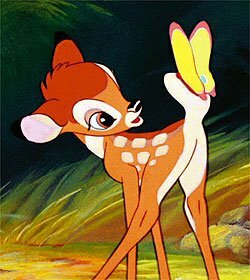 That was my point, and unless you'd like to prove that statement false, it stands. "But in 1864 General Pat Cleburne (a native of Ireland) suggested Black emancipation and enlistment, and was quietly shut down by higher ups." "It wasn't until a very short time before Appomattox that the South reconsidered, and by then it was far too late." So, it was politically impossible for Lincoln, the President, to sign a presidential order, but it was perfect doable for the entire South to free their slaves all at once? Please, this argument smacks of severe head-in-the-sand disease. You forget, the North had the government and economy in place, but you fault the South for not destroying their economy over something, based on YOUR 20th century mindset? You're a liberal, aren't you? He could easily have preserved it by admitting that it only had half as many states, and letting the CSA stand, enjoining good relations with them, gradually erasing their fears or removing their objections. He could have done a lot of things, but instead, he chose to invade a sovereign nation. I grew up admiring Abe, but I can't read about him anymore, because every time I see another alternative to what he did, it makes me sick. And I hate slavery, those who are proponents of it, and most of all, those sick bastards who wave that flag and hate blacks. Blacks are blacks, and they have lots of problems, but most of them have come about due to the Great Society and the hero worship of the criminal, the worship of being stupid to prevent them from acting white, things like that. Political correctness, all, and it will be PC that poisons us. I've said repeatedly that we have about fifty years left, now down to about forty five, and I'm wondering if we will really have that long if we don't start worshipping truth instead of these feel good lies. This is a splendid post, I particularly enjoyed the discussion of Stonewall Jackson. Had he not gone down at Chancellorsville, the subsequent Gettysburg campaign, and probably the outcome of the Civil War, would have been quite different. Certainly, unlike Richard S. Ewell, who perhaps illustrates the Peter Principle in action, Stonewall would have known what to do with a fleeing enemy in front of him on the afternoon of 1 July 1863. Keep up the excellent work. I love the historical context that this blog brings. Thank you for all your hard work. I got as far as Sobieski and my thoughts turned to the actress Leelee Sobieski, she's a hottie. I lived in Vienna '79-'80 while a Stanford-in-Vienna student, and studied a bit of Anthropology at the Uni itself, before adopting a more bohemian approach and took up life-drawing classes at the Hochschule für angewandte Kunst. I tried through an architect-friend connection to study under Hans Hollein but was rebuffed. Cest la vie. The plot of the film “Victoria” is based on the events and characters connected with the so-called Relief of Vienna in 1683. Consciously reaching beyond textbook information and historical studies, it presents the characters’ stories in a way typical of an action film rather than a historical one. The storyline, however, does not blur the historical facts. The Ottoman Empire has its enlightened and radical representatives. The Christian world, torn by the egoism of the leaders, listens intently to the voice of the Church. Pope Innocent XI and his nuncio d’Aviano effectively oppose not only the physical and political threat to Europe but also the loss of the achievements of its civilisation. I came back to read this brilliant post by Baron and stumbled across a comment that bothered me. Fellow Peacekeeper's comment to Zerosumgame, which was... I'm no military historian, but surely you could have found a brilliant American General who actually fought FOR us? Coming from zero, that'd mean a brilliant American general who fought for the Jews? This is precisely why there should be no religious, racial or otherwise devisive agenda within counterjihadism - it causes a fractured movement and diminishes our capacity to fight Islam, as shown by Baron in this very post regarding feuding European leaders. Imagine how well the Crusaders might've done if they'd enlisted the help of the Jews in fighting the Muslims, instead of murdering Jews right along with the Muslims. We might've had an Islam-free Middle East today! By the way, I have some Polish friends who have started an unofficial Jan Sobieski society, toasting the great King with the vodka named after him. Prost! I reflect on another of our military,Black Jack Pershing,chased Poncho round for a while. Later in his career he was in charge of fighting another insurection in the Phillipeans against Muslim extreamists. I read that his troops captured forty or so and decided to use a unique weapon . Had a slit trench dug filled it with fresh killed pigs, then lined up 39 of the Moros letting one watch what tranpired so he could live to tell his fellows, after the volley he had his men fill up the mass grave with the an equal portion of dead Moro and dead pig, from all indication ,the one who lived and told the story had the desired effect,it cooled that particular segment down quite a bit.Perhaps we should have loaded the 52's with pigs and bombed Tora Bora,Cluster hog,Ms.Piggy instead of a Daisy bomb.When "Stonewall passed his last words were I want to go across the river and rest under the trees" And folks there is a river start swimming. Cause even though I sound glib there are some dead serious folks about . Regards to all, super place to speak truth it keeps us free. wstxmike p.s. can't spell to good but I think you all get what I am trying to say. I was really surprised to hear that there is a Vodka make in Poland named after Sobieski. I am now determined to get a bottle for myself and I'm going to try to promote the Vodka in every way I can (like requesting every local bar and pub to stock it). I believe that this vodka could become the symbol of our world war against Islam and can provide a vehicle for explaining the reason for 911 and possibly open the eyes of those that don't yet know that we are currently in the midst of the 3rd jihad. Also it will provide us with a common hero to unite behind while we await the new Sobieski to lead us to victory. In the mean time we should promote this Vodka to the extent that they will need to build 3 new distilleries in Poland, and possibly start building more in other countries, just to keep up with the demand. If we all band together we can make this happen and we can all drink a toast together to our hero, Sobieski, and to our common cause...PROST!!! Thank you. Thank you. Thank you for this article. Insightful, well-researched and captivating. You can almost hear and feel the scenes are you describe them. It chills me to the bone what the 'common enemey' was capable of then, and still is today. Some things in history never change. To think what brave men protecting christian soils went through back then, and to where we are today: appeasing, bending over backwards for a ruthless enemy in the name of a marxist dictatorial of political correctness and multiculturalist appeasement. It makes me ill as there is no big difference between what they were attempting to do then, as to what they are attempting to do today, except for one thing: the denial of what is happening before our eyes by many people, and the obvious lack of strong, courageous leaders willing to stand up in our court against this enemy.